Most of us are relaxing at home, and off from work enjoying this President's Day. Anthony stayed home today and is spending time with his cousin that due to parenting schedules, they don't see each other too often. The weekend was exciting for us. Saturday, we enjoyed the first part of our day at the Children's Museum of Houston. Curious George was in town and was offering photo opps with all the children and parents in celebration of his 75th Anniversary. What a wonderful way for the children to learn about one of their favorite characters by visiting him participating in all the fun activities that the museum offers. Later we made it out to Discovery Green to enjoy the rest of the beautiful Saturday weather. 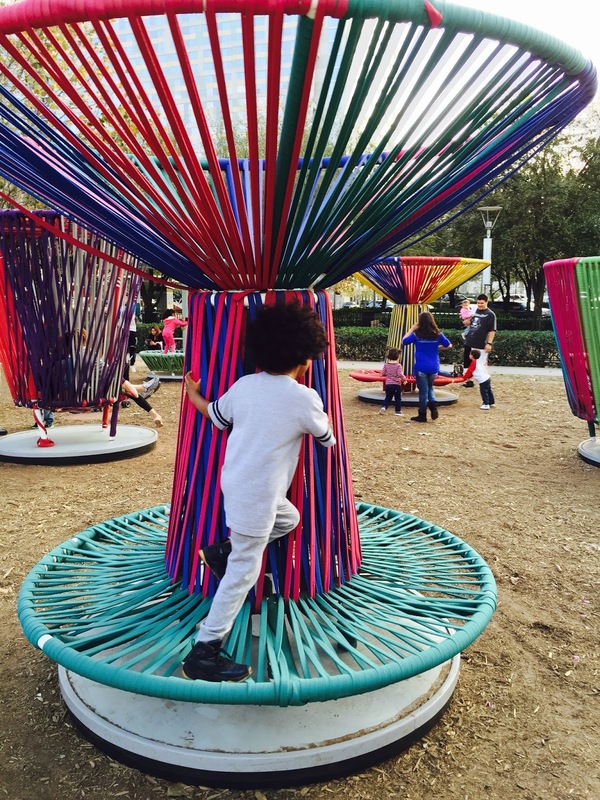 Anthony enjoyed The Trompos or the spinning tops that are presently downtown this fall - Los Trompos are interactive art installation by internationally-acclaimed Mexico City designers Héctor Esrawe and Ignacio Cadena. I love spending quality time like this with my son....he's my little best friend. Forever. Sunday, we enjoyed time with my family at my home... Some of my family came in town from Chicago and we had fun filled day eating bar-b-que, dancing to Selena and Fito Olivares and drinking Don Chelada's. yummy! My other beautiful and engaged cousin, Crystal. So proud of her also...1st Doctor in our family and she is getting married in soon! Looking forward to the wedding.